I thought this was hilarious, once I got it. What do you think? I laughed out loud when I saw this! I know! 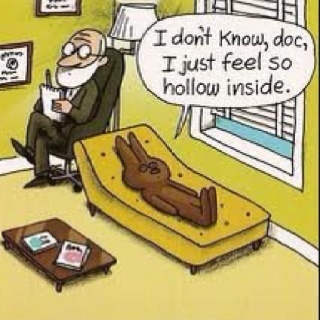 I just bought the Easter candy for my kids and this comic was in my head the whole time I searched for the solid bunnies. A few years ago, I had a roommate who was obsessed with finding a solid chocolate bunny. She dragged me to every grocery store in the county, but we finally found them. Love it! By the way, do you know the origin of the term “basket case”? It refers to the practice of having mental patients make baskets in the sanitarium. I didn’t know that! Do they still make people make baskets, do you think? I’ve never been hospitalized, but I understand that art therapy is used. would love to do one of these workshops!